People often think about factory reset option when they are having issues in handling their iOS device. The iPhone users are quite familiar with all the process, but it is the iPad Mini/Pro/2 and other users who have uncertainty regarding the working of the devices. If your iPad has some issues and you want to resolve them, then you might be looking for a guide on how to factory reset iPad so that you can fix all the issues. Here, in this article, we are providing you with various methods that can be used to factory reset iPad if you forgot the password or simply want to reset all settings and erase content. A Factory reset is simply a term provided to the removal of all data and setting from any electronic device. Ultimately, the method reset all the settings to default settings and erase all the data and files stored in the device. The Factory reset simply makes the device entirely new to be used by the owner or another person. So, whether you want to perform a factory reset on iPad Mini if it is disabled or has any other issue. The reset will wipe out all the data and apps that might be causing the problem and you will be able to resolve all the faults in its functioning too. There are several ways to factory reset iPad 2/Mini/ Pro or any other model. Follow the section below to find out the possible methods and their working. The first options the users have for resetting iPad Pro/Air/Mini and other models are using the Settings app. Also, make sure that you have performed a backup of your data so that none of the data will get lost after the reset. You can make a backup of the data right before the reset too. Just go to Settings app, open iCloud, select the Backup settings, and tap on Backup Now. Wait for the backup to finish and you are ready to factory reset your device. Step 1. Open the Settings app, and go to General Settings in the menu. Step 2. In the General Settings, scroll down to look for Reset option and tap on it when you find it. Step 3. You will see various Reset option in the next screen such as Reset Network Settings; Erase All Content and Settings, etc. 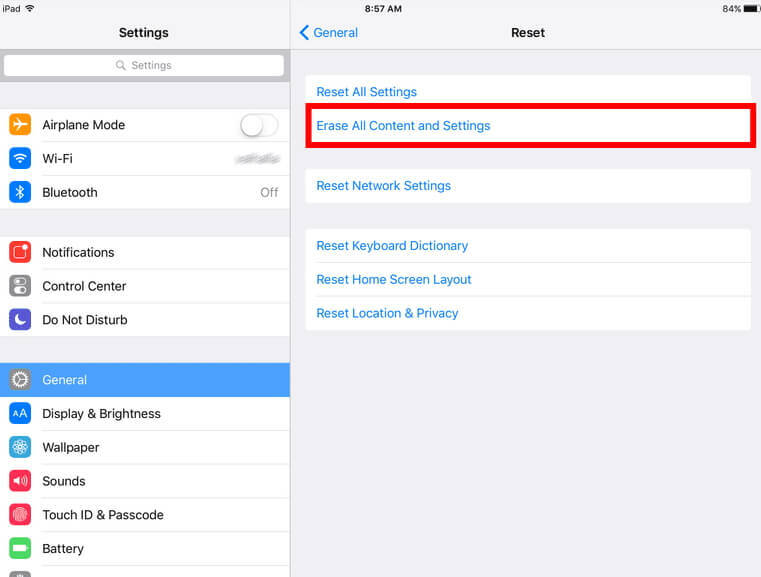 Choose the Erase All Content and Settings because only this method will remove the data and settings both. With this method, you will be able to remove your iTunes account details from the iPad. There are some unlucky people who are locked out of their iPad because someone else entered the wrong passcode 6 times. This simply disables the iPad and you will be able to log in after some time. However, if you have forgotten your password, then the situation will become a lot more complicated than before. But thanks to Apple Inc, they have provided a solution to this problem too. The users can use iTunes to factory reset iPad without a password. Note: To restore disabled iPad in iTunes, you have to make sure your iPad has synced with iTunes before. If not, you can skip to Part 5 to reset iPad without password or iTunes. Step 1. Ensure that you have the latest version of iTunes installed on your computer and perform reset via a system that you have used before. If you use a new computer then the password will be required to sync the iPad to iTunes. Step 2. Now, launch the iTunes and go to the Summary tab. Also, connect your iPad to the computer and iTunes will automatically detect the iPad. Step 3. The iPad detail will appear on the screen. Just tap on the Restore option to restore your iPad to factory settings and all the data and settings will be removed along with the passcode. You can recover the data of your iPad from iCloud or iTunes backup during the set up of your iPad. Another option that users have is using the iCloud. The people who have lost their iPad and don't want that someone will access their personal data can opt out for this method. The iCloud allows the users to reset the ios devices without having a physical access to the device. Note: To follow the steps in this part, you have to ensure that Find My iPhone option is enabled on your iPad. Step 1. Visit icloud.com in any browser of your computer. At first, you will have to log in to your Apple iCloud account. Step 2. Once you are logged in, you will see various options. Choose the Find My Device option and select your device in the next screen. Step 3. When you select your device, it will provide you with 3 options, i.e. Lock your device, play a sound and Erase it. Choose the Erase your iPad option and iCloud will remove all the data and settings on your iPad immediately. Thus, iCloud will factory reset your device with just one tap eliminating the risk of data theft. If the iTunes method fails to fix the problem of your device or even worse, iTunes does not recognize your iPad, then you will be stuck in an unusual situation. Luckily, we have a solution for that too. There is another method that can perform factory reset iPad 2 without iTunes. It is the Any iOS System Repair that is specially designed to resolve all the issues and problem arises in iOS devices. The software is capable of keeping your data safe even while performing a complete recovery of the iOS. 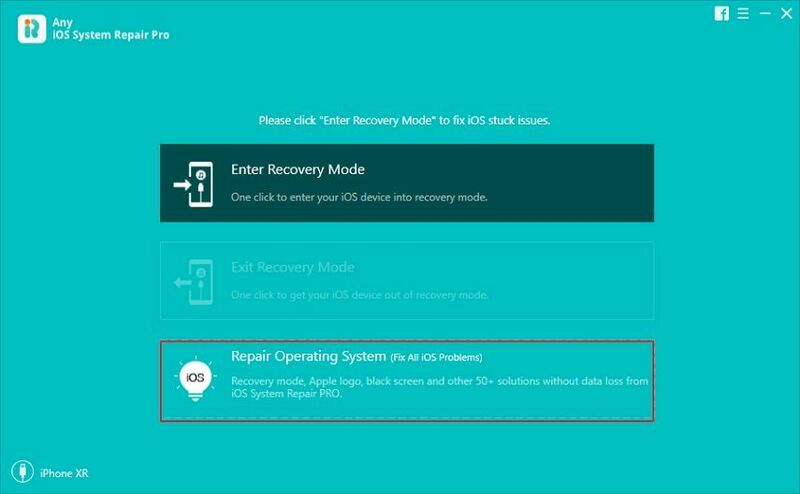 Note: If your iPad is stuck in recovery mode, Apple logo or other stuck issues, you can click Repair Operating System on the main interface,and then click Fix Now to repair the iOS system without data loss. Step 2. You'll enter the following screen. The Deep Repair can factory reset iPad without password or iTunes. Hence, if your iPad is disabled, you can bypass iPad password by this method. Step 3. Download the Firmware package and wait for the downloading to finish. Step 4. When the firmware is downloaded, click on the Start Repair/Fix Now option and the repairing will start. By the time repairing is finished, you will have access to your iPad without any passcode or using iTunes for recovery. We hope that now you know how you can do iPad factory reset. This method can be applied to any iPad model without a hitch. The Any iOS System Repair (ReiBoot) will fix all the problem of your iOS devices easily and quickly. Users can use the software on both Mac and Windows operating system.